1966: Dark Shadows premiered on ABC. 1984: Guiding Light's Bert stood after losing her leg. 1995: One Life to Live's "Tommy" was enraged. 2003: Passions paid homage to the musical Chicago. 1952: ABC Radio aired the final episode of Lone Journey after a 12 year run on multiple networks with multiple sponsors. 1955: On The Brighter Day, Lydia Hamilton (Murial Williams) struggled with her conscience after taking a silver clock. 1963: On Ben Jerrod, Agnes (Jeanne Baird) lost her temper for the second time. "My name is Victoria Winters. My journey is beginning - a journey that I hope will open the doors of life to me, and link my past with my future. A journey that will bring me to a strange and dark place - to the edge of the sea high atop Widow's Hill - a house called Collinwood. A world I've never known, with people I've never met. People who tonight are still only shadows in my mind, and who will soon fillthe days and nights of my tomorrows." Six months into the Dan Curtis-created show's five year run, ghosts were introduced and then other supernatural elements which helped the afternoon soap opera become a favorite among younger viewers. 1967: On Dark Shadows, in a further attempt to locate Cassandra, Nicholas placed Tony under an hypnotic trance. 1968: On The Doctors, Ed Stark (Conrad Roberts) told Nick (Gerald Gordon) about how the Vietnam War changed the life goals he had mapped out before. 1968: On Dark Shadows, Victoria and Carolyn mourned Maggie’s reported death. Victoria agreed to be Elizabeth’s witness at her wedding. 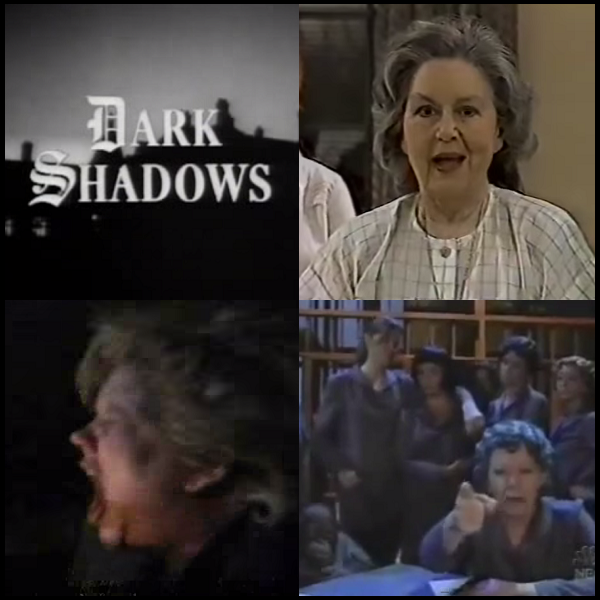 1969: NBC aired the final episode of daytime soap opera Hidden Faces. The series was created by Irving Vendig and focused on a law firm that was dealing with a high profile murder case throughout its six month run. Some of the show's stars were Conard Fowkes, Louise Shaffer, Tony Lo Bianco, Stephen Joyce and Linda Blair. 1969: On Dark Shadows, Magda used the hand of Count Petofi in an attempt to lift the curse from Quentin. 1984: On Guiding Light, Bert Bauer (Charita Bauer) stood up for the first time after losing her leg. 1991: At the 18th Annual Daytime Emmy Awards, winners included As the World Turns (Drama Series), Santa Barbara (Writing, Directing), Peter Bergman (Lead Actor), Finola Hughes (Lead Actress), Bernie Barrow (Supporting Actor), Jess Walton (Supporting Actress), Rick Hearst (Younger Actor), Anne Heche (Younger Actress). 1995: On One Life to Live, Viki's (Erika Slezak) teenaged boy personality, Tommy, was enraged when his car stalled. 2003: One of Passions' famous musical production numbers, "I Ain't Sorry!" aired. It's a full-scale rendition of Chicago's "Cell Block Tango," as Edna Wallace (Kathleen Noone) fantasized what prison life would be like if she, daughter Beth (Kelli McCarty), Charlie (Jordan Baker), and even Precious (BamBam) were to be arrested for kidnapping Sheridan Crane. NOTE: The film Chicago had just won the Academy Award for Best Picture a few months prior to this episode. 2005: On As the World Turns, Lily (Martha Byrne) and Holden (Jon Hensley) told Luke (Jake Weary) about Lucinda's breast cancer.